The names of gunfighters are legendary: Butch Cassidy and the Sundance Kid, Doc Holiday, Jesse James, and Billy the Kid, Patt Garrett, Henry Plummer, Bat Masterson, Wyatt Earp, Wild Bill Hickok .... These Men, and others like them epitomize the image of the Wild West. Around the turn of the 19th century the free-roaming gunfighters found the wild country could no longer hide them as technology, in the form of telegraphs and telephones, cut off escape routes. 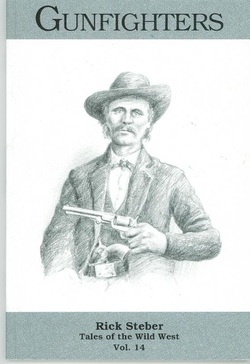 Even though the era of the gunfighter had drawn to a close, writers and movie makers, using the colorful backdrop of the Old West, turned the frontier gunfighters into larger-thank-life folk heroes, folk heroes who will never die. Paperback, c1998, 58 p. : ill. ; 14 cm.